On Friday the 8th of May, my Dad took me out to breakfast and I got to pick the place. I recently spoke about wanting to try out all the new food places that have been popping up in the area and I am determined to do just that. 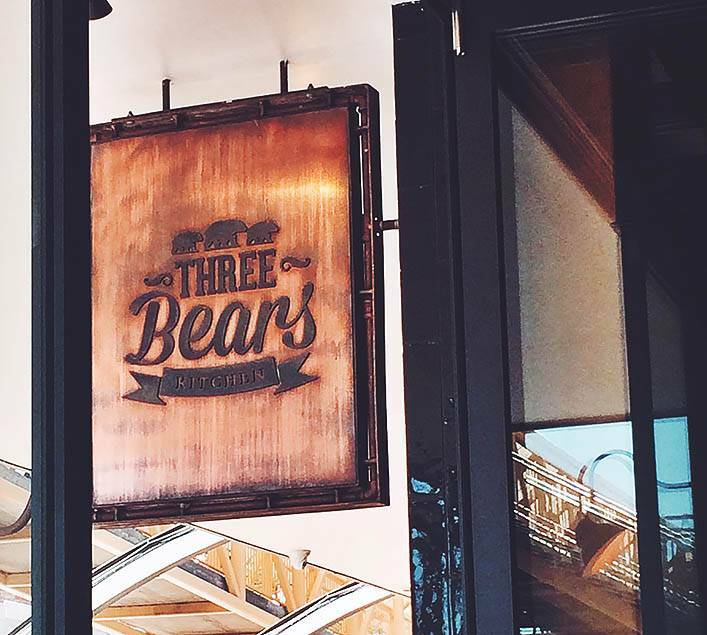 Three Bears Kitchen opened in Newcastle in mid March this year and I was buzzing to try it out. From the vintage decor to the original refurbished ceiling this place somehow pulls all the vibes of being both vintage and modern at the same time. The waitresses were incredibly lovely and the service I received was definitely up the top with that of Newcastle eateries. Definitely something that will bring me back to a place. I ordered The Green Machine for myself. Usually it comes with poached eggs, which I do not eat. So I asked for no eggs and they asked if I would like to replace it with anything. Tomato it was. These restaurant reviews are starting to turn into me scouting the city for different ways I can eat avocado on things. I haven't actually eaten Kale before (shock horror) but I was pleasantly surprised, and it went well with the spinach. I felt incredibly healthy eating all of those greens, and it's a much more appropriate breakfast than I would usually have of a morning. My father is a big meat eater unlike my mostly vegetarian self and he picked the Three Bears Breakfast as his meal of choice. 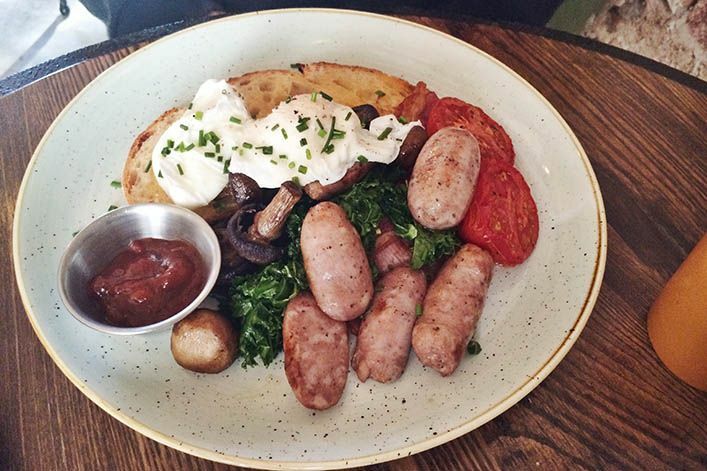 With freshly made pork sausages and bacon, and a plethora of roasted veggies this is definitely not a plate for the small eater. Though there is a half serving on the menu. 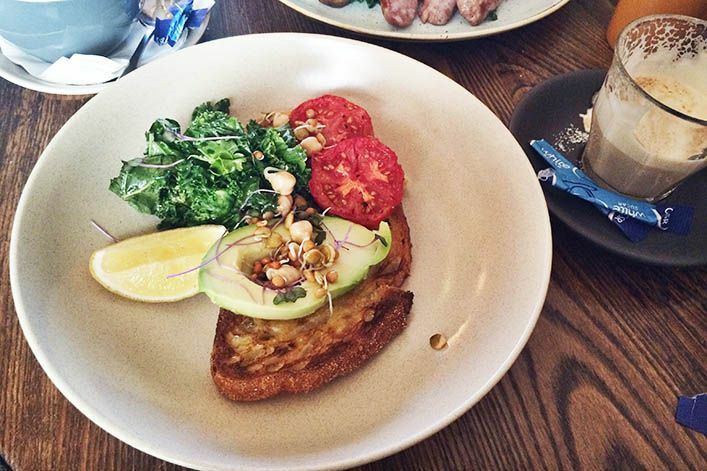 An improved twist on the usual big breakfast options at your morning eateries. I can tell you that my Dad was suitably impressed and could barely eat all of the quality selection. The two of us also ordered coffees with our meals, a Soy Chai Latte for me and a Cappuccino for him. I've had my fair share of Chai's at a lot of different cafes and this was definitely up there in quality flavour. The same can be said for the cappuccino. I had a lovely time at Three Bears Kitchen and I definitely hope to be back. In fact my Dad simply couldn't wait and returned the following day to attempt the lunch menu with his partner. Excitingly enough the Three Bears Kitchen is soon to be opening up for dinner on Friday & Saturday nights, where they have a set menu and a different country's cuisine for each month. May is Spain! At $55 per head, and BYO Wine I would love to go sometime and try it out. Bookings are of course essential. You can see the details on their Global Dinners here. You can find the Three Bears Kitchen on Facebook & Instagram. Looks delicious! Love lots of veggies and these look great. Makes me hungry. I'm a big fan of veggie food too. Ohh, we get to Newcastle semi-reguarily. 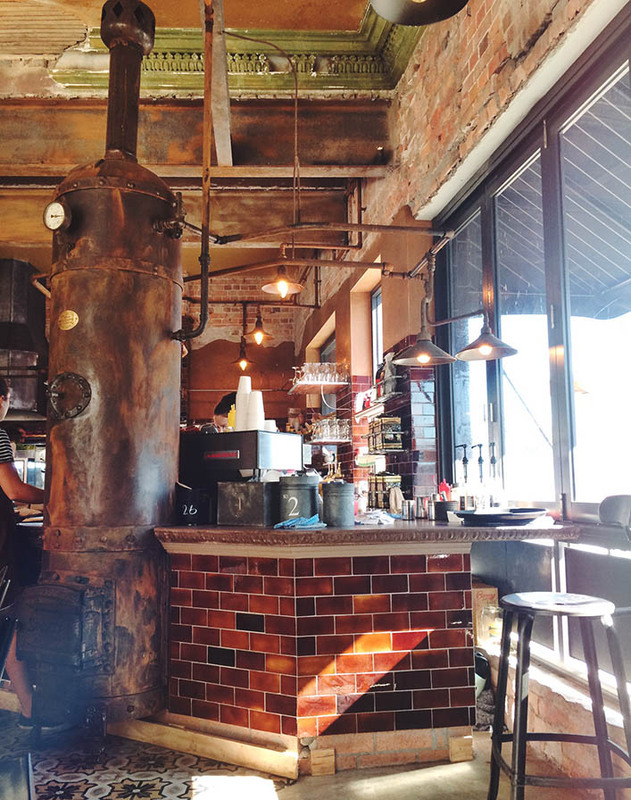 I'll be putting this cafe on the list of places to visit! Ooooh, this looks ever so delicious! This place looks so awesome, I need to come and live by you because you seem to just have the best places to eat nearby! Wow I love everything about your blog! You take beautiful photos too! What a cool place~~ food look so yummy! !